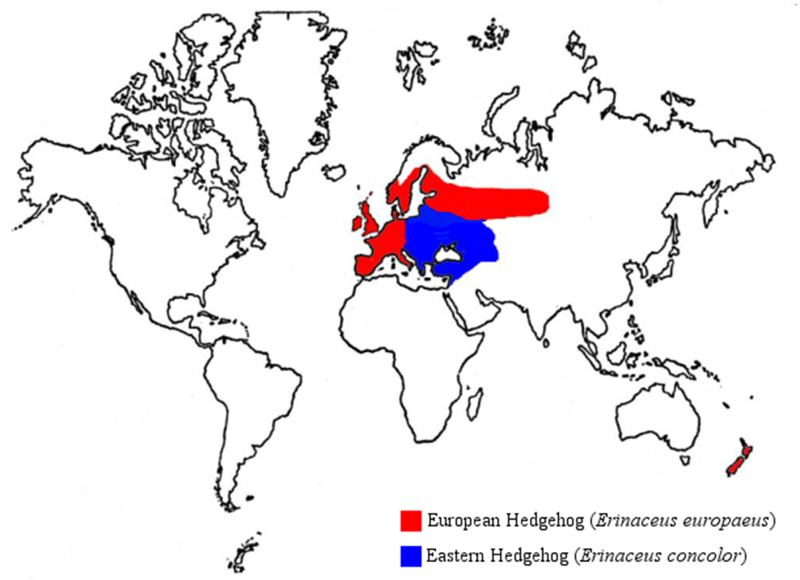 The ancestors of modern hedgehogs lived in Asia some 25 million years ago, towards the end of the Palaeogene; their descendants are thought to have spread across Europe, Africa and into North America. Today, Erinaceus europaeus is widespread throughout the lowlands of Britain, present in every county and most offshore islands. Indeed, in his booklet, The Hedgehog, Pat Morris wrote of how hedgehogs are prone to being scooped up in loads of thatching, peat and animal fodder such that they may have been widely transported during prehistoric times – this, Morris suggests, may explain their presence on many islands. They’re found across much of western Europe north to southern Scandinavia and Finland, and south to the Mediterranean. In July 2004, a European hedgehog was found dead on a road in the Chvojnicka Pahorkatina hills, which represents the first (and to my knowledge only) confirmed record of this species from Slovakia – if a population can be identified, this would push the verified range further east. This species is found at elevations to 2,000 m. Some early naturalists, Giraldus de Barri writing in the 12th century, for example, listed the hedgehog as absent from Ireland at the time, although subsequent authors suggest it may simply have been overlooked. The current thinking is that hedgehogs were probably introduced to Ireland since the last Ice Age about 11,500 years ago, presumably as food. During Morton’s survey period, 26 hedgehogs were recorded from South Uist and, although he didn’t attempt to estimate the population, Morton considered there to be little doubt that hedgehogs had established a breeding population in the south-west corner of the island. In a subsequent paper to the Journal of Zoology, RSPB biologist Digger Jackson presented the results of his hedgehog survey on South Uist; he calculated the hedgehog population to be about 2,450 animals in 2001. I know of no recent surveys on the island; a figure of 5,000 recently appeared in an article in the Daily Express, but I’ve been unable to verify this. The Scottish Natural Heritage website lists hedgehogs as present on the neighbouring islands of Benbecula and North Uist, suggesting expansion. In his book, The Naturalisation of Animals and Plants in New Zealand, published in 1922, Geo Thompson described how the Canterbury Acclimatisation Society introduced the first pair of hedgehogs from England to New Zealand in 1870 (on the ship Hydaspes), but both died without breeding. Subsequently, in 1885 a further 100 were imported from Britain by the Otago Acclimatisation Society, 97 of which died in transit and the remaining three appear not to have become established. There are reports of hedgehogs having been found in Sawyers Bay in 1890, but no record exists of their introduction. Consequently, the 12 hedgehogs imported to Christchurch from Britain by Peter Cunningham in 1892 represents the first documented successful introduction to New Zealand; they escaped from the pigeon coop in which they were being kept and thrived. In The Complete Hedgehog, Les Stocker gives a date of 1910 for the introduction of some South Island individuals to North Island. No wild hedgehogs of any species exist natively in America.